FIDIC places strong emphasis on the presence of Young Professionals in the Consulting Engineering industry and is committed to encouraging future leaders in their career. 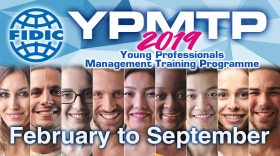 We therefore have the pleasure of announcing the 14th edition of the Young Professionals Management Training Program ready to start in February 2019. The 2018 FIDIC Annual Conference which took place in September in Berlin reached its summit of success thanks to the presence of over 40 bright and talented Young Professionals from all around the world. As we look towards next year’s FIDIC conference in Mexico City, we again wish to offer young professionals the opportunity not only to attend the program but also become speakers at the conference. The FIDIC Young Professionals Management Training Programme – a seven months online management course for future leaders in the consulting engineering industry and similar technology based firms. The 7 months course has two main elements: an online part where participants work in their office or at home using the online platform for communication, and a conference part where all participants meet for a 5-day intensive face to face training and mentoring prior to the annual FIDIC conference in September. The course is based on FIDIC principles and document standards. The reference textbook is the FIDIC Guide to Practice (GtP). The electronic copy of the book is provided to the participants, together with other FIDIC relevant documents. More information on FIDIC 2019 YPMTP: here. Registration for the Programme: here.